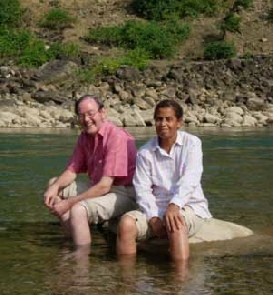 The Nepalese part of the team were Kashi Gywali, Milan Maharjan and Dinesh Mistra (Surgeons). Mr Roy, our general Mr “Fixit”, also yet again kindly gave his time. 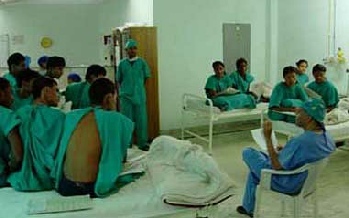 The Community ear workers, led by Purun, helped in the selection of patients, running of clinics and post op care. 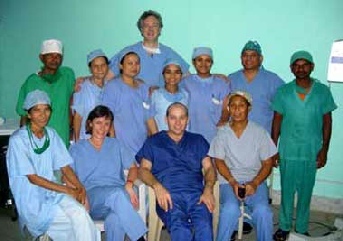 A total of 102 major ear operations were performed. As usual we are most grateful for the help given by the Nepali scrub nurse team and the administration of the Nepalgunj Medical College who allowed us to use their facilities. It was a good camp in that we managed to get through a large number of cases and also that the peace accord between the government and the Maoists was finally signed whilst we were out there. More patients arrived than normal for outpatient assessment, mainly due to the fact that those villagers who live in the rural and hill villages felt safe to travel because of the Maoist ceasefire. On our day out, mid camp, we were again able to go on the famous “team picnic” , due to cessation of hostilities…an outing of the whole team to a river in the middle of nowhere where we were surrounded by local children who were fascinated to see their faces on digital camera screens. The Great Ormond Street Hospital.